Join a band of villainous anti-heroes in Suicide Squad, a 5 reel, 50 payline video slot from Playtech. Based on the DC Comics movie of the same name, this game comes with plenty of wild extras as well as offering a chance to win 1 of 4 jackpot prizes. Play on your PC, tablet or mobile from between 50p and £500 per spin. If you’ve seen the 2016 film Suicide Squad, then you’ll find plenty that’s instantly recognisable in this video slot version. The purple reels are made up of an assortment of lower value weapon-based symbols including swords, knives, baseball bats and crosses. Potentially more rewarding are the 5 members of the Suicide Squad which spin in full stacks. You’ll see El Diablo (Jay Hernandez) and Katana (Karen Fukuhara) which pay up to 3 times your bet per payline followed by The Joker (Jared Leto) and Harley (Margot Robbie) which pay up to 4 times your bet per payline. Deadshot (Will Smith) is the best of the standard symbols. Land 5 of him and you’ll receive 5 times your bet. There’s also a standard wild, the Enchantress logo symbol, that replaces all other symbols. The gameplay here is pretty simple but there are a couple of extras that should pique your interest. First up is the Suicide Squad Wilds feature – land 1 of the 5 Suicide Squad members in a fully stacked formation on any reel to trigger these. You’ll then see some dog tag wilds added to the reels. The number awarded depends on which Suicide Squad members acted as the trigger. You’ll get 2 extra wilds if it was Diablo or Katana, 3 if it was The Joker or 4 if it was Harley or Deadshot. These wilds substitute for any Suicide Squad members but not the weapons. The dog tag wilds fall off the screen 1 at a time on each spin that follows. Enchantress Mode feature – land a full stack of the Enchantress symbol on any reel to activate this mode. The stacked Enchantress is replaced by 4 standard Enchantress logo wilds which can replace all other symbols. Any dog tag wilds on view also transform into Enchantress logo wilds. All wins in Enchantress mode receive a 2x multiplier boost too. 1 Enchantress logo wild is removed with each spin that follows. The Enchantress mode continues until all of the wilds have fallen off the reels. Suicide Squad also offers the chance to land potentially life-changing sums as it’s part of the DC Super Heroes Jackpot network. The Jackpot Game feature can trigger at random on any spin. Play the pick me round which will then determine whether you win the Mini, Minor, Major or Grand Jackpot. 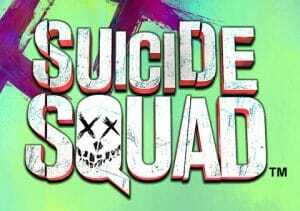 Like most movie tie-in video slots, plenty of effort has been thrown into the design of Suicide Squad. It has a slightly grungy feel which fits the subject matter rather well. The guitar heavy soundtrack does too but it’s very repetitive and had us reaching for the mute button. The gameplay in Suicide Squad is very straightforward. There aren’t any free spins here but the wild extras hit regularly enough to keep the pace high enough. The best opportunities arise from the Enchantress Mode feature where all the extra wilds and 2x multiplier can have a big impact. Comic book fans should find plenty to like here. The wild extras make Suicide Squad worth a look, even if you’ve never heard of Deadshot, Harley and the rest of the gang. I would also play Justice League (from Playtech) which offers more in the way of bonus features. T&Cs Apply Offer 1: UK & IRL only. Deposits made with e-wallets not valid for this promo. Bonus wagering x35 on eligible games. Winnings from bonus capped at £/€500. Spins available after bonus is redeemed/lost. 10 per day with no wagering. Offer 2: UK & IRL only. Deposits made with e-wallets are not valid for this promo. Bonus wagering x35 on eligible games, game weighting applies. Minimum deposit £/€20. Full T&Cs apply.